Benefits are available to those employees who are regularly scheduled to work at least 32 hours per week. Medical insurance is provided through Sanford Health. Benefits are available to employees who are regularly scheduled to work at least 20 hours per week. Medical insurance is provided through Sanford Health. Used for sick-calls, vacations, and high acuity/census days. No benefits are available to these positions. Used to replace employees gone for short periods of time for vacations and medical or maternity leaves. No benefits are available to these positions. Are you looking for a career where people come first? Join the team at Jacobson Memorial Hospital Care Center. 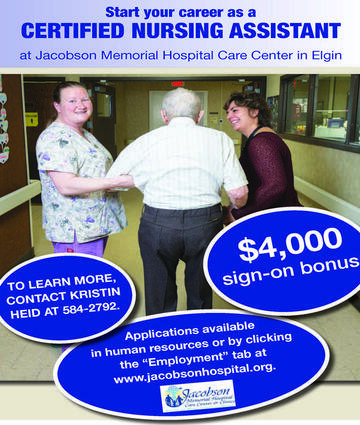 For more information or to apply, contact Human Resources at 701-584-7247 or email kheid@jmhcc.org. To learn about benefit options, click here.